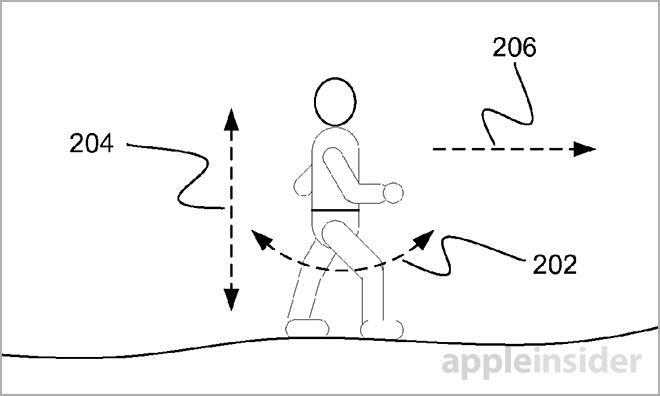 The U.S. Patent and Trademark Office on Thursday published an Apple patent application covering a smart wrist-mounted pedometer that can automatically determine its location on a user's body and compensate for missed steps using advanced processing algorithms. Apple's "Wrist pedometer step detection" is yet another direct indication that the company is at least considering wrist-worn health devices, something that has been rumored for months as the burgeoning wearables market gathers steam. As described, Apple's invention deals with step detection, or more specifically step detection based on the location of a pedometer. Prior to smartwatches and similar health meters, pedometers were mainly worn on a person's body, meaning their internal sensors had much less "noise" to filter out when tracking steps. The latest generation of pedometers, step counters and smartwatch devices decipher signals from built-in tri-axis accelerometers to measure movement. 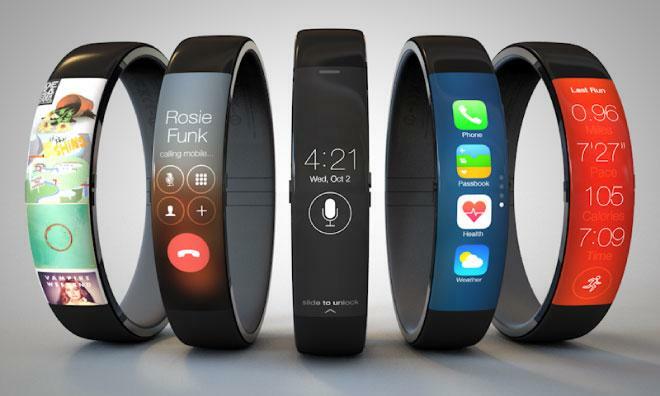 Many products, like the Nike FuelBand, boast displays and are meant to be worn on the wrist. Others are able to take readings while attached to any part of the body. Since readings from on-board sensors reflect detected changes in magnitudes of forces, including gravity, software analysis now plays a large part in outputting accurate movement data. As far as the hardware is concerned, spikes in directional magnitude can be masked by arm swings, jolts of taking a step or a bump against a keyboard. Further, current algorithms based on peak magnitude and step frequency data fail to sufficiently take into account possible missed steps. For example, some systems compare a moving average of magnitude measurement thresholds, a technique that can miss steps due to motion interference. This is especially problematic when a device is worn on the wrist as a user's arm swings may offset or otherwise disrupt readings. Apple's proposed implementation looks to intelligently parse generated raw data, translating it into an accurate representation of steps taken and distance traveled. More importantly, the system frees the user to wear the pedometer device anywhere on their body. Specifically, the patent filing describes a system that converts motion data into acceleration magnitude and analyzes the results to determine a dominant frequency. The product is further analyzed by comparing peak-to-peak threshold crossings and the amount of time between crossings. As noted in the document, the method allows for constant adjustment. When a discrepancy arises, the system may compare the peak-to-peak swing threshold of the invalid threshold crossing to data collected immediately prior. If the invalid threshold is greater than or equal to the last valid threshold, the system automatically adjusts and counts a step. In addition, Apple's invention also calculates time between steps and can infer when a step is missed due to interference cause by arm swing. This cadence extrapolation can lead to greater accuracy even when the device is placed elsewhere on the body. Graphs representing motion sensor data detected by a pedometer when worn on the trunk of a user's body (left) versus their wrist. One of the more interesting features of Apple's design is automatic wrist classification. In this embodiment, the device uses fast Fourier transform (FFT) frequency interpretation to automatically detect when it is being worn on a user's wrist. The same method can be used to interpret when a user begins to run. Apple's wrist-worn pedometer patent application was first filed for in 2012 and credits Yash Rohit Modi as its inventor.